Which software version and software options do I need to buy? 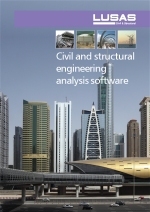 This table provides some examples of the LUSAS Civil & Structural software product version and additional software options that are required to carry out the modelling, analysis or design types shown. It is not a comprehensive list of the capabilities of these software products. To discuss and confirm the software product and software option combination needed for your particular requirements please contact your local distributor.